There are flavors that defy description because they are so unique to a single source and so unlike anything else that it’s virtually impossible to draw a comparison to anything. Cardamom is one of those flavors for me. Any attempt to describe it as tasting like anything else seems futile. I’ve read descriptors like “camphor” and “eucalyptus” and “lemon” and I suppose I can taste the eucalyptus in cardamom. It’s a sweet spice like cinnamon with the cool of mint but it tastes like neither. 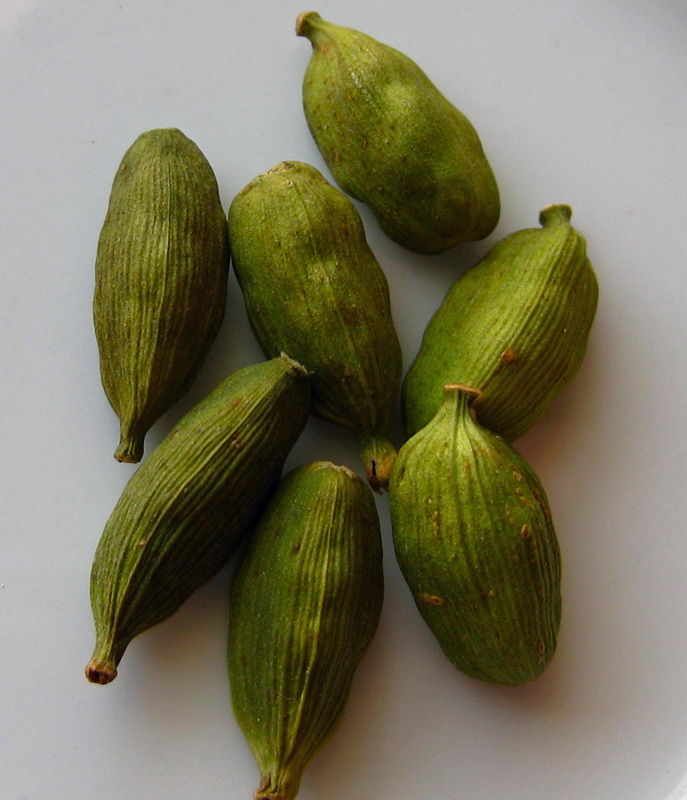 Cardamom is warm and intensely satisfying in its uses in both sweet and savory dishes. From chai tea to curry, basmati rice to ice cream, cardamom rocks whatever it touches. We had some heavy cream that needed to be used before it went bad and Jason suggested we make ice cream. I love vanilla ice cream but I wanted a little something more. Cardamom came to mind almost immediately. I found a recipe at thespicehouse.com that included both green cardamom pods and a vanilla bean – perfect! 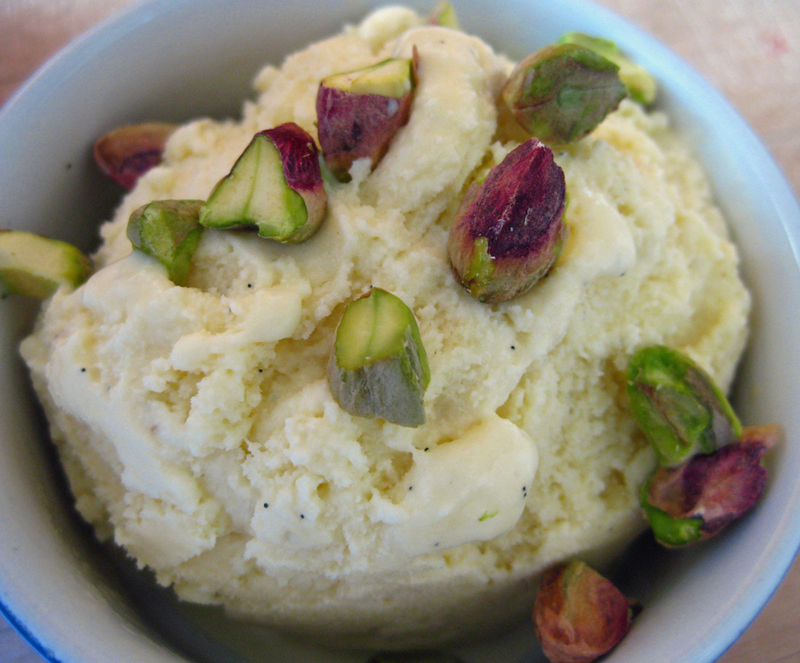 With a sprinkle of chopped pistachios, this beautifully flavored ice cream satisfies a craving for the exotic. Heat milk or light cream in a saucepan with the cardamom pods and vanilla bean. Bring to a gentle boil. Remove pan from heat and cover, allowing cardamom and vanilla to steep for approximately 20 minutes. Remove cardamom pods, split vanilla bean and scrape seeds into heated milk. Beat eggs and sugar until pale yellow. Reheat the milk. While continuing to slowly beat the sugar/egg mixture, gradually add about ½ cup of the milk, enough to thin and temper the egg mixture, then scrape the egg mixture back into the milk and heat slowly until the custard thickens and coats the back of a wooden spoon. Don’t let the custard come to a boil. If it gets too hot too quickly the egg in the mixture will cook into lumps and the custard will “break.” Once the custard has thickened, take the pan off the heat and set the pan into an ice bath and continue stirring until the custard cools. Beat the remaining heavy cream until just beginning to thicken and fold into the cooled custard. Pour mixture into ice cream maker and freeze following the manufacturer’s instructions. When the ice cream is finished it will look like soft-serve ice cream. Scoop it into a freezer-safe container and freeze for another 2+ hours to allow it to harden before serving. Scoop and enjoy!